6th Battalion The Royal Regiment of Scotland (6 SCOTS) is the Territorial Army Infantry for the south of Scotland www.army.mod.uk/6SCOTS. C Company is a dismounted rifle company covering the Greater Glasgow area. Its main role is to provide officers and soldiers who are trained and experienced in dismounted close combat to support regular units on operations. As a TA battalion, we had very limited time at weekends and evenings to prepare for the Guard, and some individuals only had a few short hours of drill rehearsal before parading on the day. In the end the Jocks did very well (especially considering that several of them had not touched rifle drill before volunteering for the Guard) and the Guard mount and sentry drill was conducted without incident. 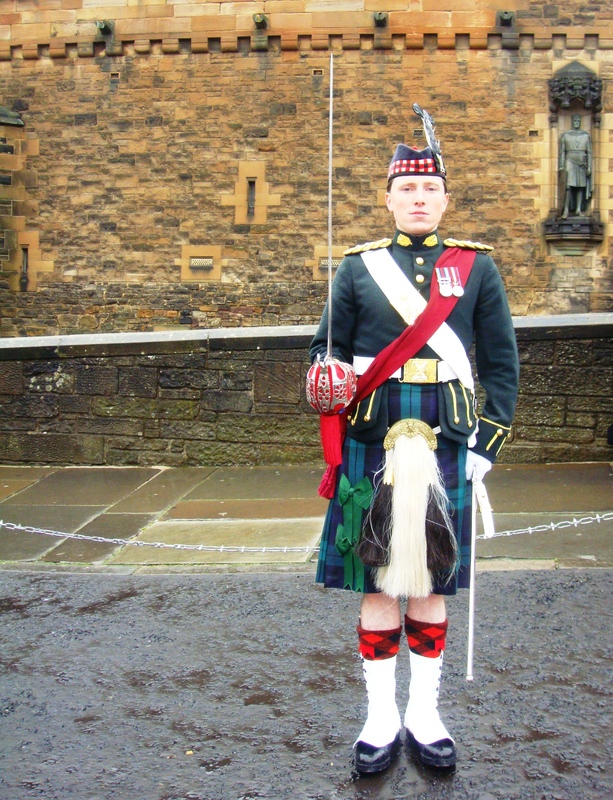 We were faced with a slight problem in Pte Mcutcheon from C Coy, who proved to be so thin that his kilt and leg-dress simply could not be tightened enough to prevent them constantly slipping down during final drill practice. Just before we marched on Sgt Lawrie, Guard 2IC, finally managed to rig out a sort of hidden webbing of green string and service dress ties to strap Mcutcheon’s into his kit, which was fortunate as by then he was just beginning to display a not-too-clean white vest in the ever-increasing gap between jacket and kilt! Unfortunately for all, the pessimistic weather forecast proved accurate and we were subjected to heavy rain throughout the day, meaning the jocks came off after each stag soaked to the skin and spent most of their down time drying off! This however did not put a downer on the enthusiasm of the bus loads of tourists from around the globe who constantly posed for photos beside the Jocks on guard. A Coy PSI CSgt Paterson, bravely assisting us as an extra SNCO, seemed none too bothered by the attention he was getting from the female members of the crowd, but was quick to hide this fact when Mrs Paterson came to visit the guard! The rain got worse during the afternoon, and the sentries at the top of the war memorial castle soon realised with the ever decreasing visibility that they were actually inside the rain cloud. 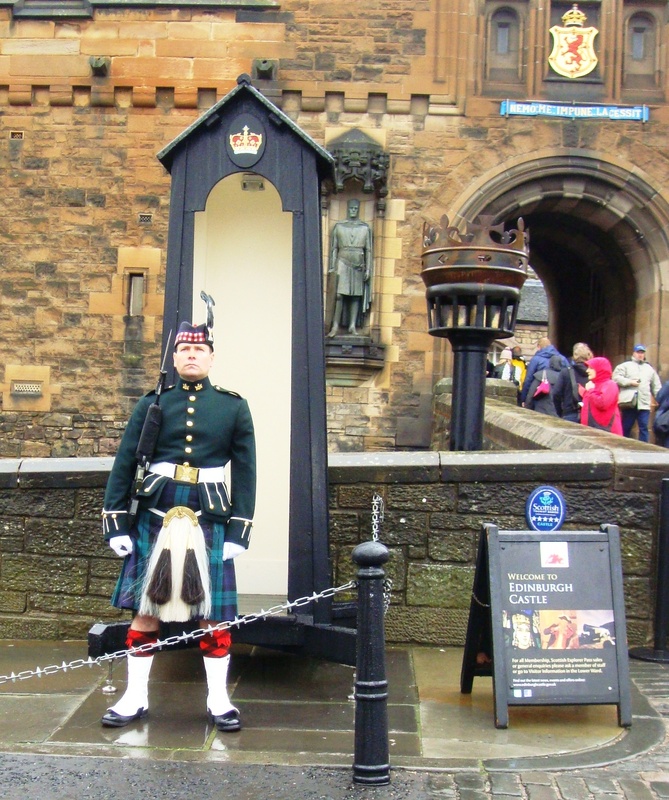 Long after the 105 Regt had completed their gun salute and they and their guests had retreated from the rain, we continued to man the sentry posts until 1800, by which time even Mcutcheon’s kilt had started to slip down again, and Lt d’Inverno’s white gloves were completely stained red and blue from the rain-drenched silk on his sword hilt. 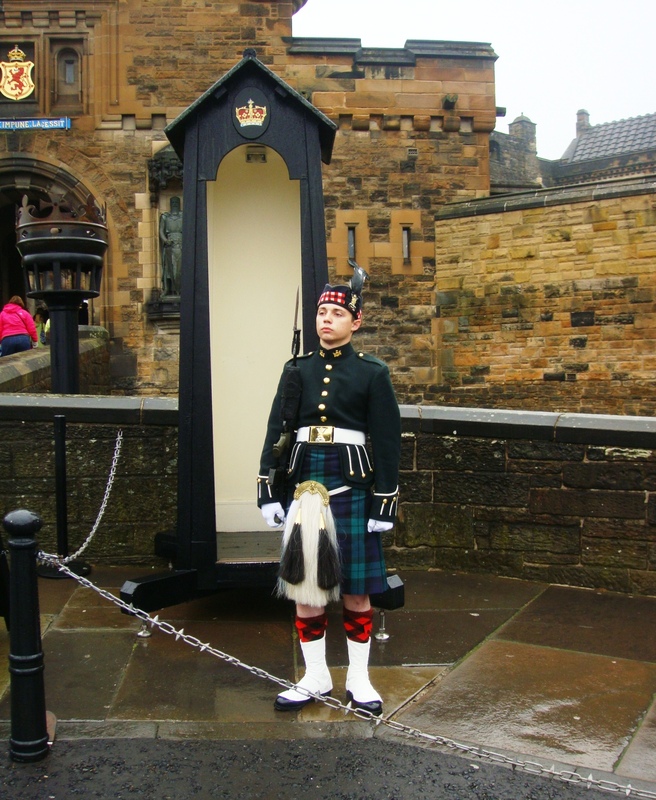 Despite the weather the Jocks very much enjoyed the opportunity to stand guard on the Castle in their No 1 Dress, an opportunity which does not often come to a TA Bn. As we shared a celebratory drink in East Claremont Street before returning to Coy locations, we were all glad we had volunteered for the guard. 6th Battalion The Royal Regiment of Scotland (6 SCOTS) is the Territorial Army Infantry for the south of Scotland. C Company is a dismounted rifle company covering the Greater Glasgow area. Its main role is to provide officers and soldiers that are trained and experienced in dismounted close combat to support regular units on operations. Members of all Companies of 6 SCOTS gathered at Motherwell TA centre to conduct Battle Casualty Drills and Team Medic Training throughout the weekend. On Saturday morning officers and senior NCOs from 205 Field Hospital arrived to conduct the day’s instruction, bringing with them a large and varied supply of equipment used in training and on current operations. The personnel were then split into groups to start their training. The groups under their appointed instructors were then shown how to perform Basic Life Support and the use of a defibulator; they then spent some time practicing this drill with us. The instructors explained our defibulator training could be transferred to a civilian qualification, and many of the troops took the chance to obtain this certificate. We were then shown the equipment that a team medic carries. We were instructed on the use of the Combat Applied Tourniquet, two different types of application, how to apply a Emergency Care bandage, the new bowlan chest seal, and how to use Adult triage cards. Everyone was then given the opportunity to practice with the equipment that was available. There was even some attempts made to sing to ‘Stayin Alive’ to help get the right rhythm for carrying out chest compressions on the resuss models. After lunch we were instructed on a primary and secondary survey, a NATO 9 Line Casualtry Evacuation request and other reports. We then practiced carrying out primary and secondary surveys on each other. Next on the programme we had Physical Training which was a steady state run down at Strathclyde Country Park, returning to the centre for another excellent meal cooked by our chefs. After dinner we had a confirmation drill and some scenarios where we had to give reports. On Sunday training resumed with the instructors from 205. 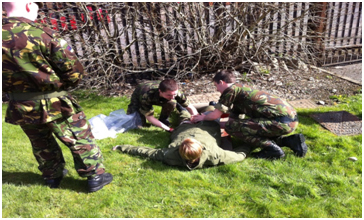 We carried out confirmation drills on the previous day’s training with casualty assessments, reports and further use of the team medic equipment. We then had a lecture in which we were shown slides of what is expected from a team medic and what injuries could be faced on operations, and how well injured personnel are treated when evacuated from theatre. After this lecture we were again split into teams and tasked to manage actual scenarios and put into place everything we had been taught. On one of the scenarios we were patrolling past a Charity Run ISAF Female school when an explosion went off and shots rung out. When assessing the situation we noticed two casualties, One an ISAF Soldier (Coalition Military) and the other a NCC (Non Coalition Civilian). Both had gunshots wounds to both legs and had arterial bleeds. It was great to get hands-on training from the subject experts, including from a trauma surgeon. We are looking forward to conducting more training in a battle exercise when it’s more realistic and under pressure of gunfire. The weekend showed us just how much is involved and required from a team medic. From the exercise phase of the training it was apparent just how much medic training we need to do as part of our job as infantry soldiers. A lot of us are looking forward to doing more hands-on training and putting into practice the skills we have been taught. 6th Battalion The Royal Regiment of Scotland (6 SCOTS) is the Territorial Army Infantry for the south of Scotland. A Company, 6 SCOTS, is a dismounted rifle company. Its main role is to provide officers and soldiers to support regular units on operations. It is made up of three platoons, two infantry rifle platoons and one specialist signals platoon. 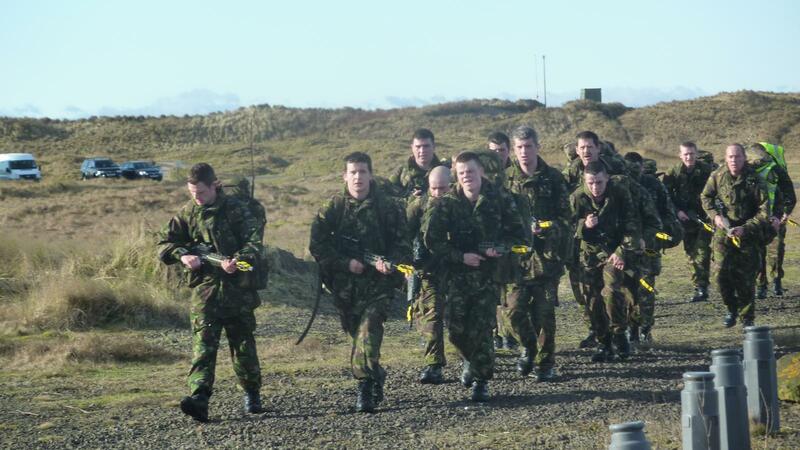 The Annual Fitness Test loaded march at Barry Budden Training Area. A relatively low turnout did not prevent us from having a good weekend up in Dundee with plenty of training value. After being treated to an athlete’s full English breakfast on Saturday morning, we kick-started training with the Personal Fitness Test, led by everyone’s favourite Physical Training Instructor, Cpl Dodds. 44 press-ups in 2 minutes, 50 sit-ups in 2 minutes and 1.5 miles in 10 minutes 30 seconds is the minimum standard. But as the motivated infanteers that we are, we all worked hard to beat the standard and push ourselves to our limits. With the RSM threatening 2nd Lt Clarke with “a punch fir ‘ivray jock that beats ‘um in the run” it appeared that the young officer was struggling to prevent himself from regurgitating his baked beans and French toast in an effort to come first in the run. A feat he never managed to achieve. After stretching off we commenced with the day’s lessons. Two sections of 10 men went through a series of practical lessons including dealing with road traffics accidents, extracting casualties under fire and section battle drills. Everyone appreciated going back to basics and getting back into the ‘green stuff.’ Many a war face was seen and primal scream heard as each enemy position was taken, and by the end of the day we were all exhausted. An early start and another warrior’s breakfast set us up for Sunday’s session of physical exertion; the Combat Fitness Test. The CFT is a 6-mile loaded march to be completed in 1.5 hours. After carefully checking that everyone’s equipment weighed 25Kg, we set off on the forced march around Barry Budden Training Area. Ninety minutes later everyone was glad the ordeal was over, and ready to crack on with the section attacks for the morning. Despite a few mutterings of sore feet and blisters, everyone soldiered on and efficiently carried out their preparation for battle. The attacks that followed were deliberately made more difficult than those of the previous day, with casualties, more cunning enemy and harder terrain to cover. However the lads responded brilliantly, and worked hard to extract the casualties out of the “killing area” and back into a safe area that could act as a Helicopter Landing Spot. With that, the weekend was done. Everyone had worked extremely hard and there was a feeling of real achievement as we cleaned the weapons and ate our mince and tatties, a fine lunch kindly delivered by our chefs, before jumping onto the transport and heading home.